Pothos is a tropical plant that has been a mainstay houseplant due to its ease of care and ready availability in the marketplace. It was one of NASA's major winners in their Indoor Air Pollution Abatement study, showing a specific ability to remove formaldehyde from the home. Use this plant in a container as a houseplant or in a combination pot as a cascading edge plant. For best results with Pothos, we recommend using a constant feed program of 150-200 ppm N. Allow the top of the soil to dry out between waterings. If grown in a dry environment (like most homes), create humidity for the plant by growing in a pot that sits in a saucer full of rocks. The saucer should be about 1/2 full of water, and the water should never touch the pot with the plant. Maintain a pH between 5.8 - 6.2. 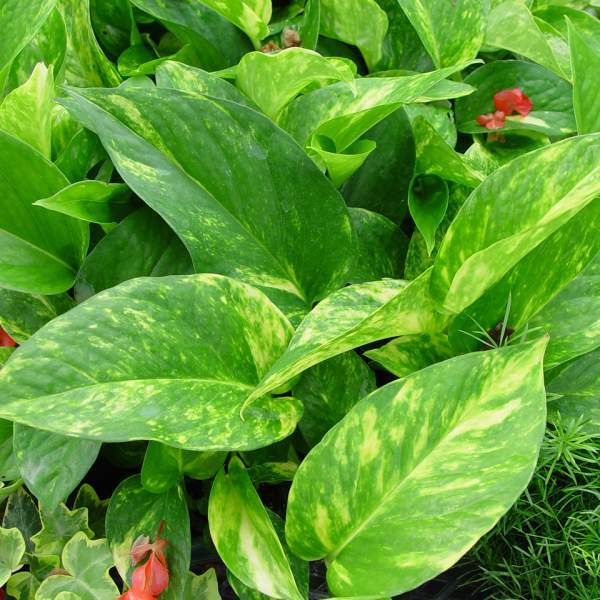 We recommend that you pinch Pothos 5-10 days after transplanting to your final container. They may require a second pinch to shape the plant for your final needs. Mealybugs and spider mites are the biggest pest problems for Pothos. Pothos are not prone to many diseases, but watch for botrytis while the days are short. This grey rot is usually associated with wet or humid conditions. You can prevent botrytis by allowing the plant to dry out between waterings, allowing for good airflow in your greenhouse, and spacing to allow the sun to penetrate to the soil level. The most common chemicals used to treat botrytis are Medallion and Banrot. Use them as a drench according to each label's instructions. We recommend planting 4-5 starter plants per 10 inch basket. Use a well-drained soil in your baskets and plant your starter plants deep, allowing the ellepot to be completely covered by the soil. If you are planting 4 inch pots, 3 plant per pot should be sufficient. Plant a triangle formation directly in the middle of your pot.